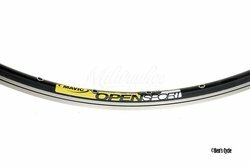 As a proud descendant of MA2, MA40 et MA3, Open Sport is the perfect blend of what have made Mavic's success on rim. It is the perfect balance of durability, weight and price. This low profile clincher is constructed out of 6106 aluminum alloy and is single eyelet-ed with a pinned joint. Its UB control braking surface features and external wear indicator. Rim has minor spotting / pitting in the paint near the decal. The effected area is roughly 5" long.